Crumbles are possibly the easiest dessert in the world to make. They're also one of the UK's favourite puddings too - especially as autumn fades into winter and everyone starts to crave the sweet and filling rather than the light and cool. This is my Apple and Blueberry recipe. I don't use a strict recipe for it - I (as they call it in the catering trade) 'cowboy' the hell out of it. I have a rough idea about weights though so if you go with the guidelines I have sort-of created you won't be able to go far wrong. This recipe makes three-four small portions. It's freezable though so if you don't want to eat it all in one go (try not doing) then you can simply save it for another day. 1. Preheat the oven to 200C. Put a small amount of water in the bottom of a pan (about an inch) and leave to heat on the stove top until it simmers. 2. Put the peeled and chopped (you can go as big or small with your fruit pieces as you personally prefer) apple into the water and leave to stew slightly. 3. In a mixing bowl put 75g of butter/butter alternative, 125g of caster sugar and 200g of flour as well as a teaspoon on vanilla extract. 4. Gently rub the mixture between your fingers until you create a crumble consistency. I prefer my crumble quite clumpy but if you want the Caribbean sands effect then work the mixture together even more. 5. By now the apple in the pan should have softened and will be beginning to mix sweated juice with the water in the pan. Add a dessert spoon of flour to the mix to bind all of the water and juices together. Also add 25g of Demerara sugar to sweeten the tartness of the fruit (add more or less sugar dependent on how sweet you like your desserts). 6. Now add your blueberries. Mix all of the fruit and water together. Leave to stew for about ten minutes. 7. Decant the entire mixture into the dish of your choice (I'm using a bread tin here because it's only me and Dave). 8. Cover the mixture with the crumble you have made. We like a lot of crumble topping in our house but if an inch or so is usually a sufficient covering. A nice touch is to add rolled oats to the top for some crunch or a tiny touch of cinnamon to compliment the apple. 9. Put in the pre-heated oven for roughly 20 minutes before checking to make sure that it's browning and cooking. 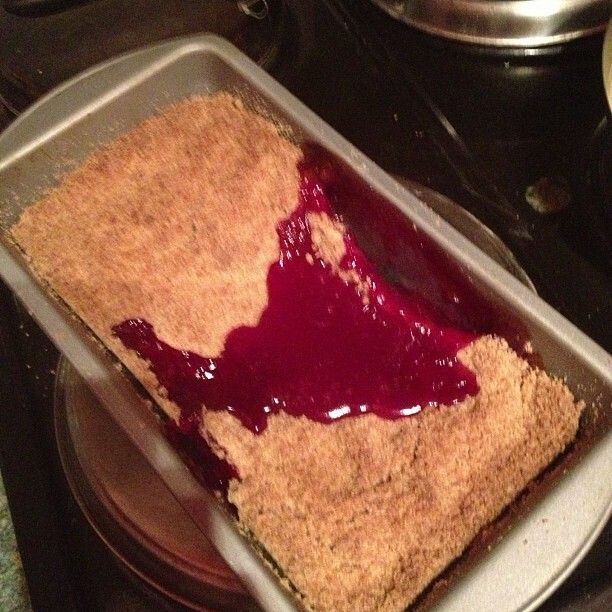 The blueberry juices will inevitably leak and surface over the crumble topping. Place back into the oven for 15-20 minutes more. 10. Leave to stand for a couple of minutes when you take the finished crumble out of the oven - then serve with either icecream, cream or custard. Enjoy! Mmm, I love crumble, it's so delish! This made my tummy rumble a lot, although instead of blueberries I'd have to add blackberries because sometimes blueberries give me a rash!